TST SWEDEN DEVELOPS AND MANUFACTURES PERSONAL PROTECTIVE EQUIPMENT WITH TECHNICALLY ADVANCED FEATURES, HIGH LEVEL OF COMFORT AND HIGHEST QUALITY. We have a complete assortment of personnel protection equipment for water jetting, water blasting, hydro demolition at High and Ultra High Pressures (HP and UHP). Our clothes are developed to offer the best possible comfort, at the same time as they protect from water jets up to 3000 bar/43,5 kpsi. We are convinced that only comfortable clothes are beeing used! 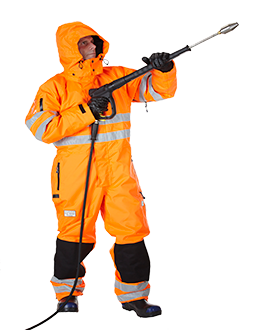 TST Sweden is now launching a series of protective clothing for high pressure liquids, for example high pressure cleaning or hydraulic maintenance. They protect, depending on equipment, up to 500 bar pressure. 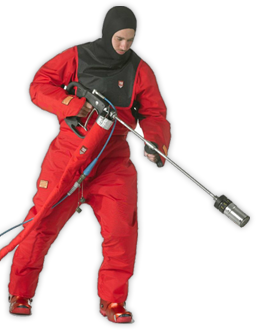 Thanks to the knowledge and experience of protective clothing for waterjetting, up to 3000 bar, we have been able to manufacture very good garments. We have three keywords - comfort, function and safety. Are you looking for cooling garments that doesn't require neither electrical hook up nor batteries, or use strange chemical reactions? Our cooling products have energy elements, which absorb heat. They do it without having to provide any external energy! If your work requires cover alls or hazmat suits, you will extend your action time and shorten recovery time using TST Cooling Vests! Help workers involved in Katrina and Fukushima know the benefits of TST Cooling concept. 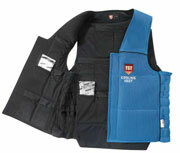 TST started developing Heat Protection equipment in 1990. We have thorough experience and a big network which continously gives us feedback on the function of our products. We listen and keep developing in order to get better and make work easier for our users. Protection against chemical dangers is a specialty at TST Sweden. We are especially good at handling condensing gases like for example ammonia, but we also have equipment for taking care of leaking fluids and fires.